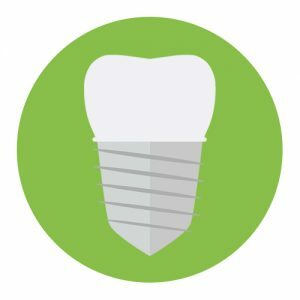 A dental crown is a custom made tooth used to either cover weak teeth, occasionally following root canal, or replace missing teeth as part of treatment with implant’s. Teeth that have very large fillings can be weak and prone to repeated fracture and breaks. This can lead to repeated filling and even the removal of the tooth. Dental crowns act as a cover for a weak tooth, effectively holding the remaining tooth and filling together, saving time and money in the long term and preventing the need for repeated treatment and giving confidence in an otherwise weak tooth. The fitting of a crown is generally completed over two comfortable appointments. During the first visit the tooth and its filling are prepared to ensure that there is no decay and is a stable foundation to the crown. An impression is sent to a laboratory to custom prepare a crown made from high strength dental alloys or aesthetic ceramics to match your smile. After a short time the crown is fitted and permanently bonded over the tooth to restore strength, form and function. A dental bridge is a precisely fitted replacement for missing teeth which can also reinforce teeth either side of a space if they are weak and likely to break. Fitted over two simple appointments, teeth either side of a space are covered over with crowns made from high quality materials simultaneously serving as anchors for replacement teeth. Well maintained bridges provide a lasting, comfortable and highly aesthetic option for the replacement of missing teeth.